Adrian Flux Home is one of the leading specialist home insurance brokers in the UK and one of only a few offering a full range of insurance cover to owners of properties located in areas at moderate and high risk of subsidence, or those who have already suffered from subsidence. Many people who have never actually suffered from problems of subsidence, will find that they have been categorised as living in a subsidence area for house insurance purposes. We can take a more individual view than most, and offer a premium reflecting the actual level of risk. If you live in an area deemed to be a subsidence risk, you will probably have experienced problems getting building insurance. Subsidence or threat of subsidence can also lead to massively increased premiums from certain insurers. That's where Adrian Flux can help. Our Home & Contents cover will make sure that your home is adequately covered in the event of a mishap, and at a price you'll like. Full cover for properties within any subsidence area. For house insurance customers who take both buildings and contents cover, we offer substantial discounts. 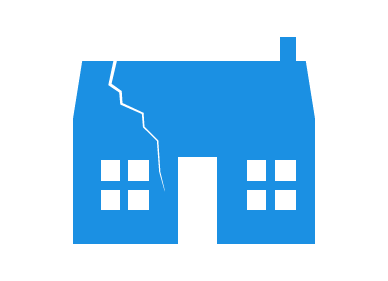 Because homes at risk of subsidence are, by their nature, a non-standard insurance risk, all our policies are designed especially for your individual situation and our staff have a high degree of knowledge in this field. "We knew that, having had a subsidence claim in 2009, we might have problems finding competitive insurance for our home - or even any cover at all. But Adrian Flux gave us a competitive quote without any problems at all, albeit with an increased subsidence excess."